The life of Muhammad Ali reached beyond boxing, leaving an imprint on politics, race, civil rights, and rhetoric. And even after his mythical career met a grim end, he kept on fighting without lacing up his gloves. In 1984, at age 42, Ali was diagnosed with Parkinson's disease, a nervous system disorder that involves the destruction of dopamine-producing neurons, resulting in tremors, rigidity, and other movement-related symptoms that worsen over time. As the battle raged on through the decades, the disease robbed boxing's greatest champion from the bombast and loquaciousness that he carried into the ring. But even then Ali remained a beacon, a living example to the roughly one million Americans who suffer from Parkinson—and millions more around the world—that a life with the disease didn't mean one without dignity. For more insights into Ali's struggle against Parkinson's disease, Fightland spoke with Dr. Michael S. Okun, chairman of neurology at the University of Florida, national medical director for the National Parkinson Foundation, and the author of books including 10 Breakthrough Therapies for Parkinson's Disease. 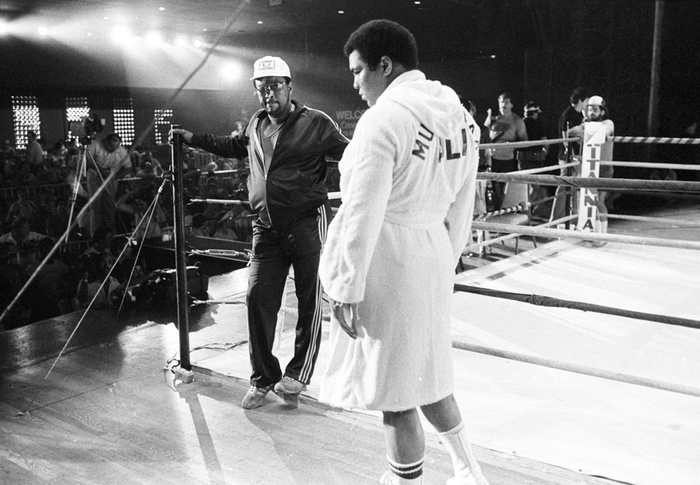 Fightland: Muhammad Ali had a well-documented history with Parkinson's disease. Generally, how do boxing and sports that involve head trauma stack up as contributing factors to Parkinson's disease, compared to genetics and other non-traumatic factors? Dr. Michael Okun: You have to be very careful about drawing the immediate conclusion that it's the punches and the potential concussive issues that have been the cause of what's gone on with Ali. A couple of things to remember: he presented with symptoms in his 30s and 40s, the symptoms started on one side of his body and remained more predominant on one side than the other, and he was very responsive to the dopamine medication that's given to Parkinson patients. We now study patients that have had Parkinson's for 10, 20, 30, or 40 years in some cases—we try to understand why some patients live longer than others, and he had a typical course for a patient. It's a different picture than you would get from pure chronic traumatic encephalopathy, just from getting hit in the head or being punch drunk. Certainly there are features—the slurring of speech, for example—that might be more suggestive of some of the punches that he took. But I'd be very careful about drawing a conclusion that this syndrome that he had was due to getting hit in the head. It might have been a secondary [thing] that brought out the symptoms, but this is a course that's very typical for patients with Parkinson's disease. Meaning it's typical of Parkinson patients that might not even be athletes, just general members of the million-plus population that has the disease? Right: it's asymmetric, it responds to dopamine, it progresses over many years. Some can go many years or decades with the symptoms, lead good lives, and have a slowly progressive asymmetric disorder. That's pretty much what Ali had, and he did a remarkable job living with it. We just have to appreciate the fact that without more data, I don’t think it would be responsible to conclude that [his condition] was due to getting hit in the head multiple times. Whenever you have symptoms that start below age 50 with Parkinson, the chances go way up that you're dealing with a genetic form of Parkinson. We know that over the last decade or two. We see a lot of patients that have these genetic syndromes, like Michael J. Fox, that present in their 30s or 40s, and Ali would fit that characterization. What's the general progression of Parkinson symptoms? It's the most complex disease in clinical medicine. It has over 20 motor and non-motor features, and it has a variable response to different medications and different surgical options, so every patient looks different—if you see one Parkinson patient, you've [only] seen one Parkinson patient. Typically, it's slowly progressive and some patients can go decades, but some patients can't. It's not one disease: it's multiple diseases that have similar symptoms. Some people with Parkinson have tremors, and believe it or not, some people don't. We can't assume it's all one disease. Everyone will be a little different. In the case of Ali, he had a slowly progressive, milder form of Parkinson, and he lived a good life—a very meaningful life for multiple decades. The reports about Ali's death mention that he was admitted to the hospital with a respiratory issue and that his Parkinson's disease complicated that respiratory issue. Can you shed some light on what that might mean? Basically, what you'll read in medical literature is that the most common cause of death associated with Parkinson is aspiration pneumonia. That's where you get particulate matter—say, the food you're swallowing goes into your lungs instead of your stomach. That's what we worry about the most along with infections and so forth. This is true of other chronic diseases and of aging as well: if you get old enough and frail enough and develop enough comorbidities, these are the things that you watch out for. And certainly with decreased movement and decreased ability to move around, that's not good for the lungs. We like to keep people moving and exercising. We've learned that the hospital is not a great environment for Parkinson patients through a series of recent research studies to try and manage our patients with Parkinson to keep them out of the hospital, keep them safe. If you go to a hospital, three out of four patients don’t get their meds on time every time—they can get the wrong medications like dopamine blockers, they can fall, they can get infections and so forth. And remember: if you're fortunate enough to live a long time, pneumonia is the sort of thing that gets people that live a long time. There's no standard test for Parkinson. How do you diagnose a new case? Believe it or not, the best way to diagnose Parkinson is clinical. See a neurologist, especially a neurologist with an expertise in Parkinson, though there's a shortage: only about 40 are trained each year in the United States. A neurologist will look at the criteria for motor and non-motor symptoms, often times before the appearance of tremors and stiffness and slowness. There can be pre-motor symptoms like a reduction in smell, or you might get constipation, you might start acting out your dreams in something called REM sleep behavioral disorder. The symptoms that are most disabling—and people find this really shocking—but study after study has shown that the most disabling symptoms with Parkinson are the non-motor symptoms: depression and anxiety. Depression is the largest unmet hurdle for Parkinson, which is directly associated with chemical and biological changes—it's not just because they're sad because they have Parkinson. So you see a doctor, the doctor should look at you and look for that asymmetry—if you don't see the asymmetry, you start to worry if it's a medication issue, a trauma. You look for the asymmetry, the stiffness and slowness, the motor and non-motor features, and then you give them some form of dopamine and follow them for a few months. Gene tests don't help you that much—only 10 percent of people are gene-positive. There are different scans where you can look at dopamine. But at the end of the day, the best diagnosis for Parkinson is seeing the patient, following them, watching their course and making sure it matches the course of Parkinson, and watching their response to medication. That [approach] is far better than any technology that we've developed so far. When you think about Parkinson as a worldwide issue and a worldwide phenomenon, Muhammad Ali is easily the highest profile person to have suffered it. Do you have any final thoughts on his contribution to putting a spotlight on Parkinson's disease? He testified in front of Congress—he was the spokesperson for the National Parkinson Foundation in the 1990s—and he was an outspoken advocate. He raised $120 million in Arizona for the National Parkinson Center of Excellence. The list just goes on, but the big one is bringing attention to the disease, and helping people suffering to know that you can live a better life, and that there is life with Parkinson's disease. Parkinson occurs in every country, every continent, and every culture around the world. Him shining a light and showing people you can live a meaningful and happy life with Parkinson and not let your disease define you—that's a contribution that's going to last generations.